It would be wildly inappropriate to begin a walkthrough with cursing, but I am sorely tempted. not so fast. 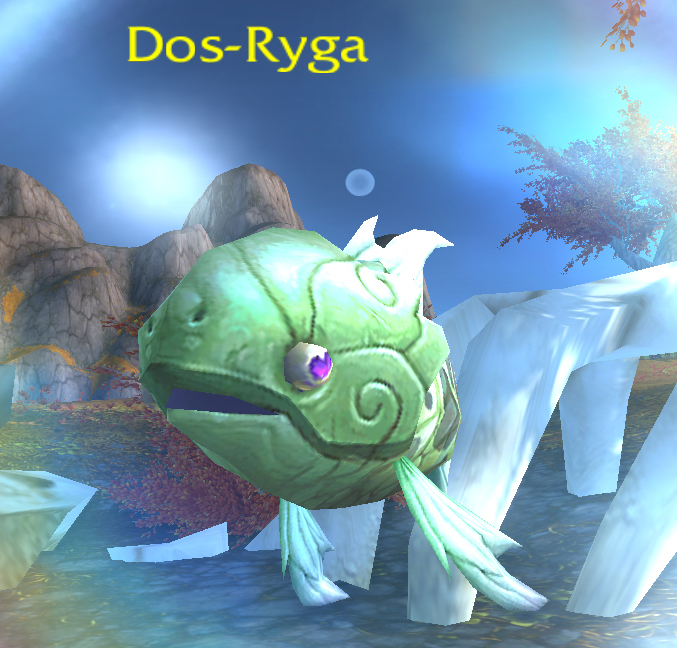 While Dos-Ryga has an aquatic nuke with Whirlpool, that is on a relatively long cooldown, but his main nuke Frost Breath is, bizarrely, a Dragonkin move, meaning that Undead pets defend strongly against him. There’s also quite the wrinkle in his third move, a massive heal. Luckily it’s on a cooldown as well, meaning that this is a good place for a burst synergy team. The Shrine Fly adds 2 DoTs, one Flying, which really packs a punch. 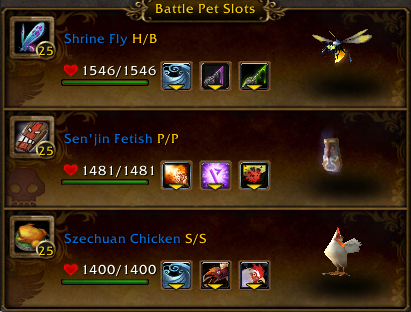 The Sen’jin Fetish adds Wild Magic, and has a bit of an extra defensive boost because it’s Undead. The Chicken is there because of Flock. Nearly any substitution involving these 3 abilities, or proxies to these three abilities (eg, Expose Wounds vs Wild Magic) will work swimmingly here. Get it? I said swimmingly, and he’s a fish? We’ll start off the fight with that Shrine Fly and its two DoTs. There is one oddity here though. 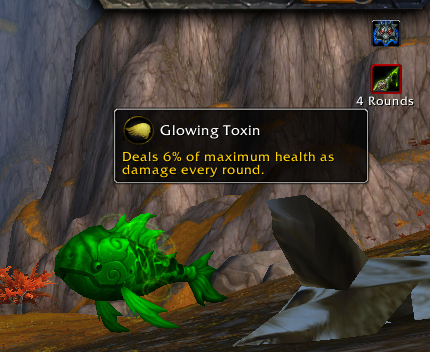 The Shrine Fly’s Glowing Toxin will always deal 6% of the target’s health per tick. The only thing you can use to buff this move’s damage is something like Sunlight, which buffs max health. It’s still a really good move to keep in your pocket for single-pet fights like the Beasts of Fable, because it’s unaffected by the halfed-damage Boss buff these pets have. But, it’s also not going to be buffed by the rest of the moves we’re about to set up, while the other is. This isn’t a bug. It’s intended. Don’t panic. Have your towel? Moving on. After we hit Dos-Ryga with the first couple DoTs, the fight starts to get a little hairy. Dos-Ryga’s moves are dynamic, like Nitun’s, so I can’t tell you for sure exactly how it’s going to go down. 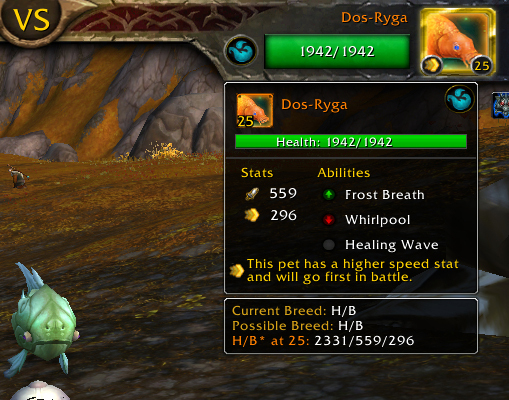 After your Fly goes in, the clock on Whirlpool is ticking, which does big damage and roots your active pet. When this happens, I just sit back and nuke a bit with the pet I’m currently using, being sure to keep up my applicable buffs (the DoT, Wild Magic, etc). Even if the stars don’t align and your DoTs from the Fly wear off before you can bust out your Chicken, you’ll still be fine as long as you keep up the duration on Wild Magic. I do advocate making your swaps ASAP and not wait until each pet in the chain dies, because dawdling will only prolong the fight. At some point, you’ll be able to put in your chicken, and that’s when the magic happens. 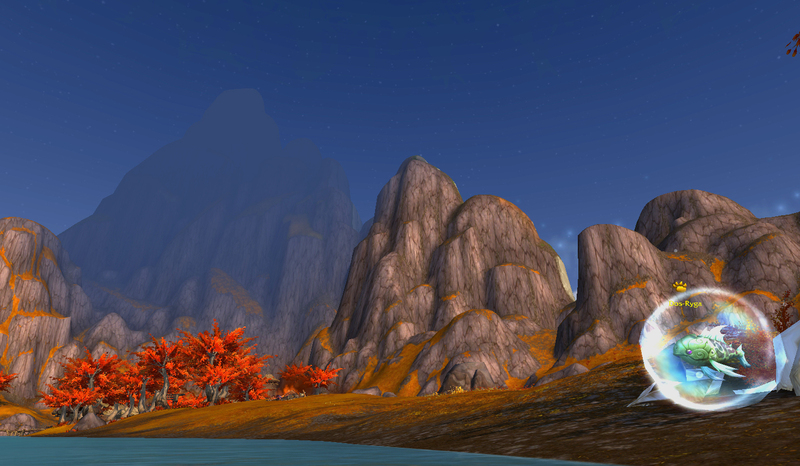 Flock away, and try not to get fish scales on your boots. The real benefit of using Flock over Howl is that, not only do you get the big buff, but each individual hit of Flock is also buffed by Wild Magic’s damage. 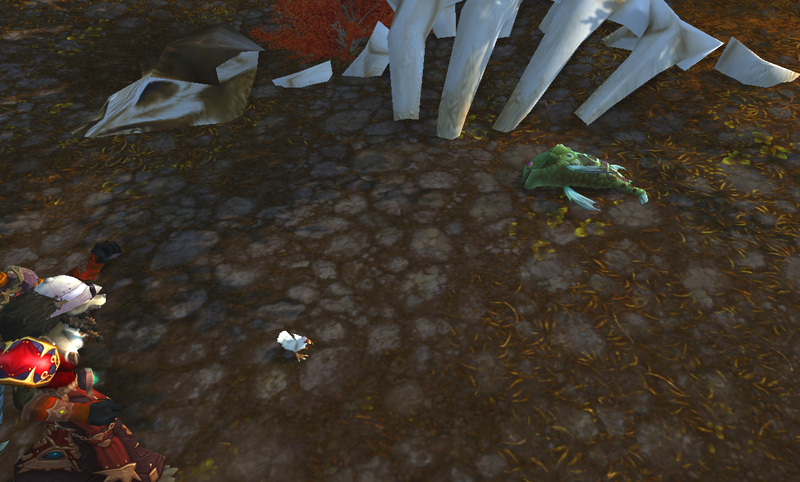 This makes Flock’s damage component go from feeble to fearsome. Alternately, you could just grab a team full of Crows and Gilnean Ravens with Darkness to half the healing and lots of frontloaded Flying damage, but where’s the fun in that? Especially since crows eat fish, and this is one fish you’re going to want all to yourself. Somebody pass the tartar sauce. 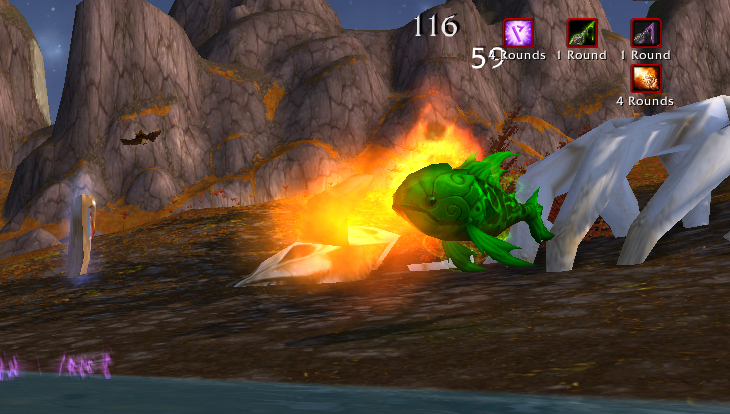 This entry was posted in Beasts of Fable and tagged beasts of fable, daily on March 21, 2014 by Liopleurodon.